Elsevier Advanced Technologyin helps professionals using fuel cells keep an eye on how technology is evolving and how major players are using it. 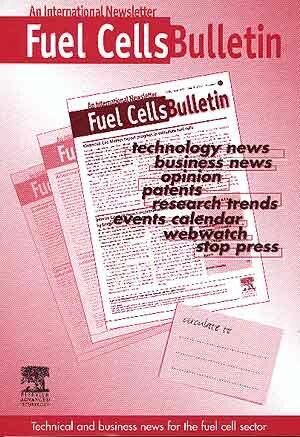 The bulletin focuses on both the technical and business developments in fuel cells, aiming to bridge the gap between user and provider as the energy infrastructure changes. The publication creates a forum where successful industry experts can share their successes and ideas. It also provides research trends, an events calendar and webwatch, a list of companies' websites within the industry.